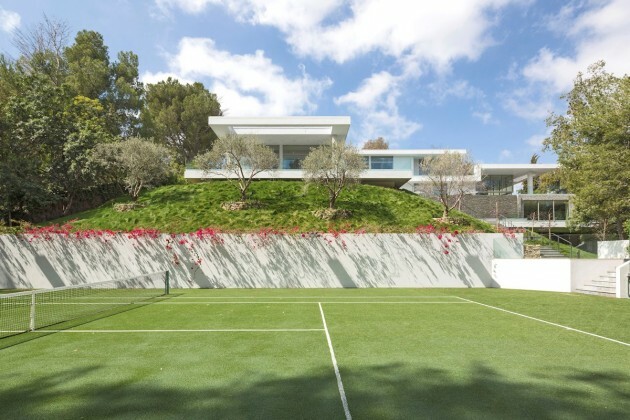 Designed by London-based Quinn Architects, the Holmby Hills Residence is located on a 57,250 square foot hillside site in Los Angeles, California. 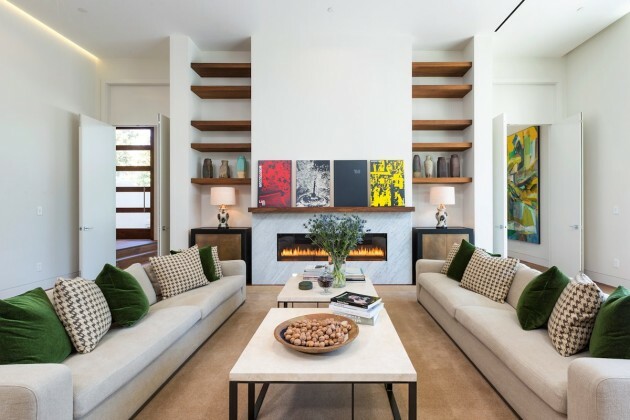 Designed by London-based Quinn Architects, Holmby Hills Residence is a speculative residential development for international property developer Estate Four. The property is situated on a 57,250 sq ft site in Holmby Hills, Bel Air, Los Angeles. The house is framed on all sides by luscious vegetation, with panoramic views of the Hollywood Hills beyond. Blending sensitively into its natural surroundings, this elegantly proportioned, secluded and private 15,250 sq ft villa was completed in January 2014. 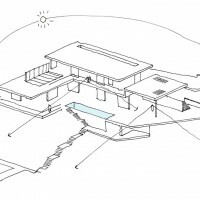 From an early stage of design development, the house was designed to respond to the tranquil surroundings of this lush hillside site. 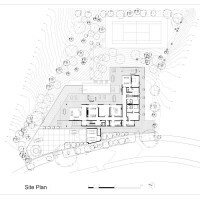 A detailed soil survey was commissioned to understand the below ground condition of the hillside, which then became a catalyst for both the architectural, civil and structural design. 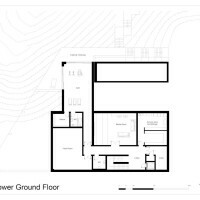 The house maximises the use of the ‘flat pad’ of the existing site, with the basement and first floor terrace emerging from the natural slope of the found landscape. The high wall that runs parallel to Faring Road creates a sense of privacy from the the expansive terraces and unique views that surround the property. The entrance sequence from the street to the house itself was designed to be dramatic, with a significant motor court and powerful 20 ft high canopy above the main entrance. 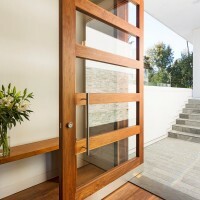 A descending staircase followed by an over-sized entrance door heightens the sense of arrival to the residence. The expansive first floor level gives 7,000 sq ft of living accommodation that is set around 6,500 sq ft of terrace space, that in turn hugs the edge of the 60 ft long infinity-edged pool and jacuzzi. The terrace gives access to over 30,000 sq ft of landscaped gardens and tennis court, via a sunken gym that is surrounded by rich vegetation. 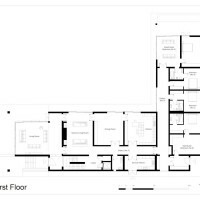 A 75 ft long gallery links the primary living spaces with a private guest suite and is designed to exhibit a significant art collection. 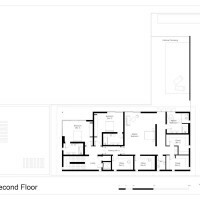 The Client’s brief called for the design of a residence that would provide space to display a significant artwork collection. The Architect’s maximised the use of natural night, using a combination of strategically placed skylights, clerestory windows and full height sliding panels. This natural light was complimented with the use of subtle ceiling downlighting, linear LED cove lighting to define the flow of the gallery spaces and low level feature lighting at a human scale and position. There is also gallery level lighting for the art collection where required. 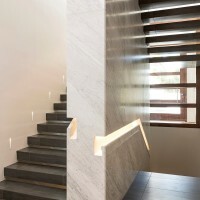 Continuous white walls running from inside to out reinforces the connection between internal and external spaces. 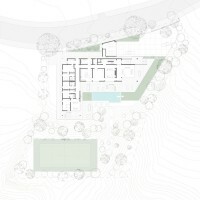 The south and west facing facades are mostly solid and provide shade for the art collection, whilst the north and east facades are mainly transparent and take advantage of the dramatic hill views. The architectural language is derived from the need to control direct sunlight and maintain inside / outside Californian living. 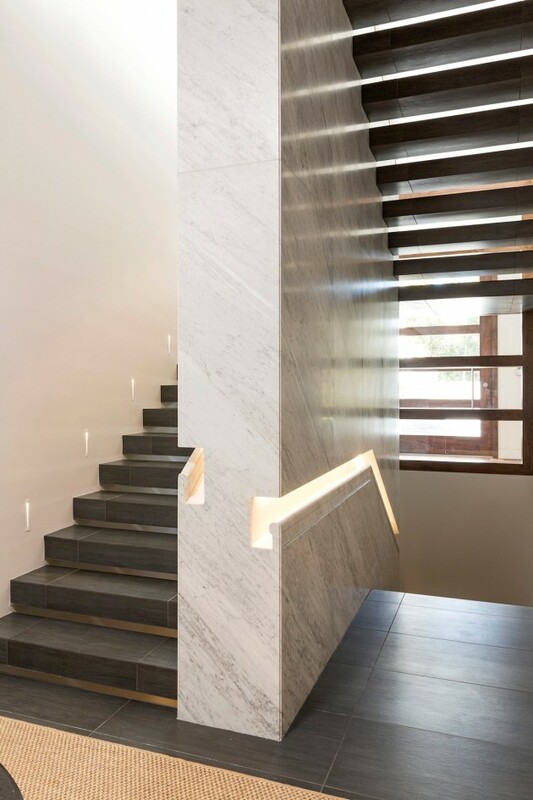 The home’s interiors feature the highest quality materials, from a marble-clad stairwell to custom recessed lighting and American black walnut flooring. There is an abundance of natural light throughout and the high ceilings give a feeling of generous volume to every space.